Successfully Added HK Warehouse Oukitel K3 Android Phone - 6000mAh, Dual-IMEI, Android 7.0, Octa-Core, 4GB RAM, 5.5-Inch, 2x Dual-Camera to your Shopping Cart. If you’re looking for an Android phone that will get you through multiple days of cell phone usage, the Oukitel K3 Android smartphone is perfect for you. This cheap Android phone comes packed with a whopping 6000mAh battery. This cell delivers enough juice to get you through several days of regular smartphone usage. With this Android phone in your pocket, you’ll be able to head out with confidence as you will never have to worry again about running out of juice. Along with its Dual-IMEI numbers and 4G support, the Oukitel K3 keeps you connected at all times. The Android phone itself runs on the Android 7.0 operating system. This OS lets you handle the latest Apps and Android features smoothly without encountering any lag. Underneath its hood, the smartphone packs a state of the art Octa-Core processor from MediaTek and 4GB of RAM. You’ll furthermore be treated to 64GB ROM and a 128GB SD card slot. This remarkable hardware allows you to use your phone for games, movies, Apps, and more. All your favorite media can be enjoyed on the phone’s beautiful 5.5-Inch display that puts forth crisp 1080p resolutions. For all smartphone photography lovers out there, the Oukitel K3 brings along plenty of nice treats. This Android phone comes packed with not just one, but two Dual-Lens cameras. At the front, it features a 13MP Dual-Camera that is great for snapping selfies and engaging in video calls. Additionally, it comes with a 13MP Dual-Rear camera. This piece of equipment lets you shoot breathtaking images and stunning Full-HD video at any time of the day. No matter where you’ll be headed next, with this Android phone at your side you’ll always be able to snap the perfect pictures. 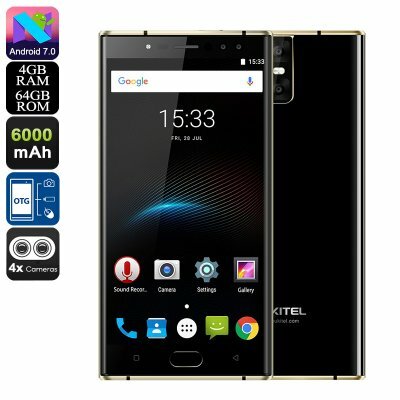 The Oukitel K3 Android Phone comes with a 12 months warranty, brought to you by the leader in electronic devices as well as wholesale smartphones..